Posted on Sat, Mar 17, 2012 : 5:59 a.m. 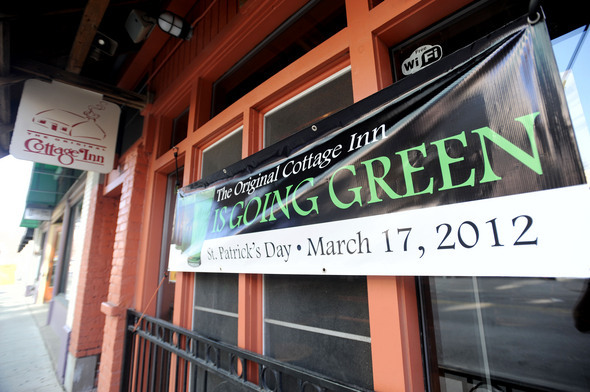 The Original Cottage Inn restaurant in downtown Ann Arbor is "going green" for the first time this St. Patrick's Day with green beer and Irish food. The sound of Irish bagpipes and the smell of cabbage will soon fill the air as local businesses prepare for one of the busiest bar days of the year: St. Patrick’s Day. With the combination of the holiday falling on a Saturday and the warm weather that has descended upon Ann Arbor this week, many bars are expecting this St. Patrick’s Day to be busier than ever. Jon Carlson, an owner of several local bars and restaurants, estimated Blue Tractor on East Washington Street in downtown Ann Arbor will be 30 to 40 percent busier than a typical Saturday. Another reason for an optimistic outlook is that St. Patrick's Day coincides with the first weekend of the NCAA men's basketball tournament. “With the great weather, it seems like people are coming out of the woodwork this week,” Carlson said. Like football Saturdays, plenty of Ann Arborites wake up at the crack of dawn to begin celebrating St. Patrick’s Day. To draw the early birds, some local bars plan to open as early as 6:30 a.m.
Conor O’Neills, an Irish pub located on South Main Street, will open doors at 7 a.m. -- the earliest Michigan bars can begin serving alcohol. But the line to get inside, said bartender Danny McCann, will start forming at 6 a.m.
Hegwood predicts Charley’s will also have a line of customers waiting to get in when the bar opens at 6:30 a.m.
For the first time in the restaurant’s history, The Original Cottage Inn restaurant is “going green” this year and celebrating St. Patrick’s Day, said Katee Cole, the restaurant’s events coordinator. As part of the celebration, the restaurant on East William Street is offering green beer and other Irish drinks. To try and capture the St. Patrick’s Day spirit, many local bars are serving up some traditional Irish fare, including Blue Tractor, Conor O’Neills, The Original Cottage Inn restaurant and Wolverine State Brewing Co. The Ravens Club, located on South Main Street in downtown Ann Arbor, plans to serve corned beef and cabbage with local root vegetables and Irish soda bread, said co-owner Jeff Paquin. Even though Wolverine State Brewery Co. isn’t located in downtown Ann Arbor, the west side bar is likely to be “pretty hopping” all day, said E.T. Crowe, the company’s marketing director. Part of the fun, she said, is the live band that will be performing Saturday night. McCann from Conor O’Neills said to expect bagpipers and Irish dancers all throughout the day, with a live Irish music band starting in the evening. Many bars plan to have outdoor patios open and expect the weather to be a huge driver of traffic. Richard DeVarti, the owner of Dominick’s on Ann Arbor’s Monroe Street, said people flock to his business for some green sangria on St. Patrick’s Day, particularly when the weather is nice and people want to sit outside. Sun, Mar 18, 2012 : 12:17 a.m. Sat, Mar 17, 2012 : 9:23 p.m.
Just stay off the roads....Could turn into a perfect storm of alcohol, sun and amateur-hour drinking madness. There's no shortage of drunks already stumblin' around downtown. Sat, Mar 17, 2012 : 7:50 p.m.
Don't. Miss yet another booze article on here. Then read about the man left in the ditch by the alleged super drunk. Sat, Mar 17, 2012 : 6:33 p.m. Sat, Mar 17, 2012 : 3:46 p.m.
Too bad this celebration has to center around bars and consuming alcohol. Celebrating Irish culture and history should be the focus. Sun, Mar 18, 2012 : 1:54 p.m. Since when is Irish culture and history not about pubs and alcohol? Ask any Irishman! Sat, Mar 17, 2012 : 8:34 p.m.
You can focus on whatever you want today. Sat, Mar 17, 2012 : 2:48 p.m.